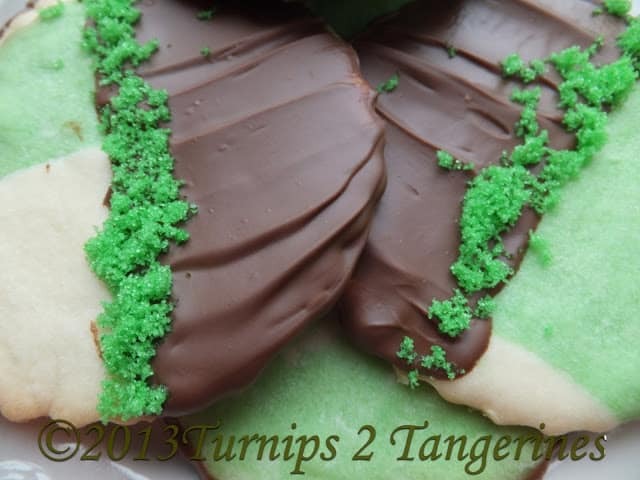 Mint Sugar Cookies Dipped in Chocolate are super delicious. Made with a basic sugar cookie recipe, they’re easy and fast to whip up whenever the cookie craving strikes. The cookie dough is flavored with peppermint extract to give it a subtle peppermint taste. One side of the swirled cookies are dipped in melted chocolate and decorated with colored sugar. After all, what is the perfect pattern to mint? Chocolate of coarse! In this recipe, half of the cookie dough is tinted green, (or any color you like) and the other half of the cookie dough is left plain. The two cookie dough halves are then lightly kneaded together. The dough is rolled out to form a swirled pattern of sorts. A round cookie cutter, biscuit cutter or drinking glass dipped in flour is used to cut out shapes. Bake and allow cookies to cool completely before dipping into melted chocolate. Mint sugar cookies are made special by dipping half of the cookie into melted milk chocolate chips. As soon as the cookies have been dipped, colored sugar is sprinkled along the melted chocolate edge. Then they’re allowed to set-up. Making these cookies not only delicious but more than pleasing to the eye. 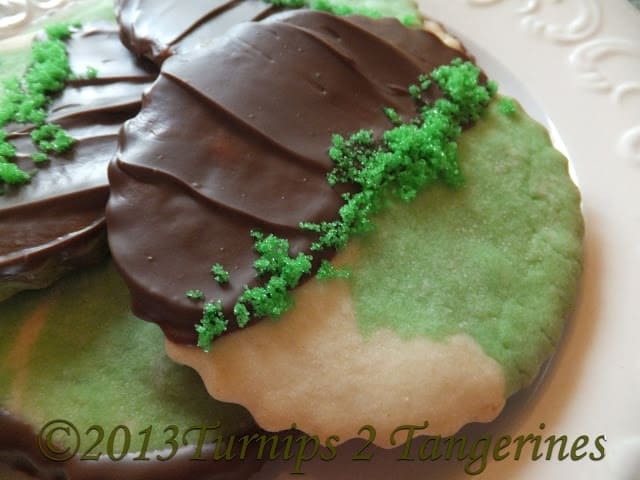 Mint Sugar Cookies Dipped in Melted Chocolate are perfect for any bake sale. Instructions for coloring sugar follows the cookie recipe. 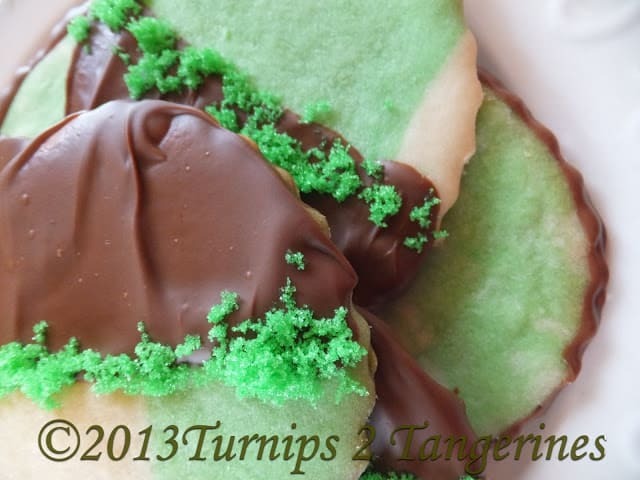 Sugar Cookies with a hint of mint, then dipped into melted chocolate. On a lightly floured surface, mix the tinted and plain dough together to make a swirl effect when dough is rolled to 1/4 inch thickness, cut with a floured round 2 inch cookie cutter. Place 1 inch apart on ungreased baking sheets. Bake at 375º for 10 to 12 minutes or until edges are lightly browned. Cool for 1 minute before removing to wire racks, cool cookies. Melt chocolate chips in microwave on high for 40 seconds or until melted, stir. Dip one side of cookie in melted chocolate, sprinkle with colored sugar. Place on wire rack until chocolate is set. How to make colored sugar. Place sugar in a small bowl, add food coloring, one drop at a time mixing well after each addition, until you reach desired color. Yum. I love mint and chocolate together, these sound yummy. The little line of sugar seems interesting too. Want to try. Thanks for linking up to Snickerdoodle Sunday. So Pretty! Perfect for this weekend! Thanks for sharing on Show Me Your Plaid Monday's!Thanks for sharing on Show Me Your Plaid Monday's! You have been pinned and I hope you come back each week! I just pinned these cookies and posted them on Facebook!!! Thank you for sharing at Freedom Fridays Blog Hop and thank you for being one of my Five Faves!! I love these cookies. I am definitely going to make them for St. patrick's Day. Thanks for sharing. 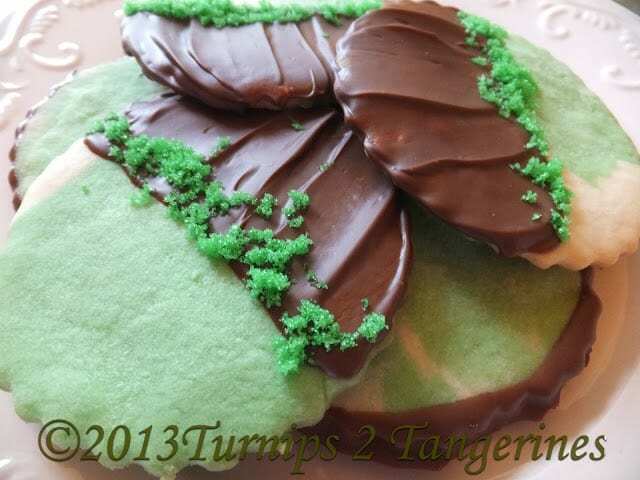 What a great cookie for St. Pattty's day, we will just love it. Hope you are having a great weekend and thank you so much for sharing with Full Plate Thursday. I loooove chocolate, I love mint so I might as well put them all together and follow your recipe 🙂 The cookies look so cute and yummy. These look fantastic! I think I'm going to have to have a St Patricks Day party with all these fun green recipes I'm seeing online! Following from the Aloha hop! delicious! Thanks for the post. Thanks for the recipe! These look soo good! I am a new follower of your blog from the Aloha friday hop! Lynn! These look amazing and so very St Patty's day-ish! I must try them! Boy do those cookies look tasty. I could hang out here all day and check out these recipes. Added you on too G+ and GFC(you can not follow back on GFC I do not think but it lets me follow others). These sound delicious and are very pretty! So pretty and colorful! Happy to be a new follower and find you through Marvelous Mondays! My son would love those, but we are trying to eliminate sugar right now. Maybe for a special treat! These look dangerously good! My family would be in heaven if I made these. 🙂 New follower…excited to have found you through the blog hop. What a great idea for a cookie! Those are so pretty!